For most people visiting Bangkok shopping is one of their priorities. 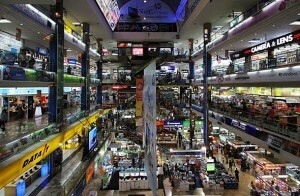 The shopping scene here in Bangkok is awesome and will satisfy the needs of even the biggest shopaholics. 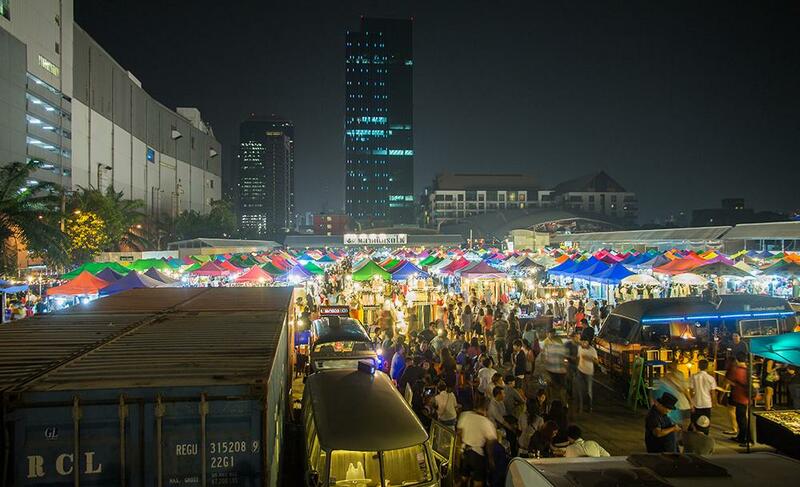 From budget wholesale markets, night bazaars to super malls Bangkok’s shopping scene has it all. It would be very easy to get lost and end up spending a small fortune when shopping in Bangkok. With so much choice how do you decide where the best Bangkok shopping is? Easy use our guide. Great opportunities to spend your hard earned money will be presented wherever you and in the city and no matter what time of day it is. Bangkok shopping truly is a 24hr affair. 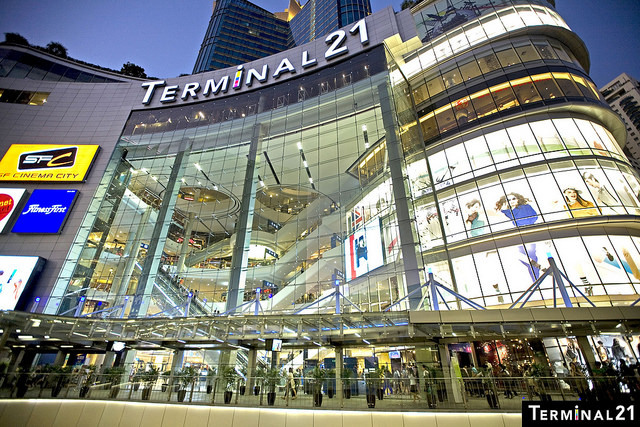 Bangkok is home to some of South East Asia’s biggest and best shopping malls. 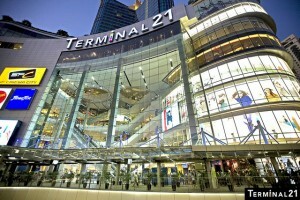 The large air-conditioned mega structures offer serious shopaholics the ability to spend spend spend. These shopping malls are home to designer boutiques, international brands and upscale department stores. Whichever of these large shopping malls you choose to visit, you could quite easily get lost for days on end inside. The architects responsible for these malls designed them with this in mind. People often wander inside the air-conditioned bliss to seek solace from the blistering heat outside, and end being slowly and meticulously parted with their hard earned cash. As well as plethora of high end shopping on offer, these malls have a wide choice of eating opportunities, beauty salons and entertainment offers such as multiplex cinemas and bowling alleys. Some even have luxury hotels attached meaning you could conceivably spend days inside without wanting for a single thing. A lot of these malls are located in the Siam Square area of Bangkok and within walking distance of its BTS stop, those that aren’t are all easily accessible via either the BTS or the MRT transport systems. 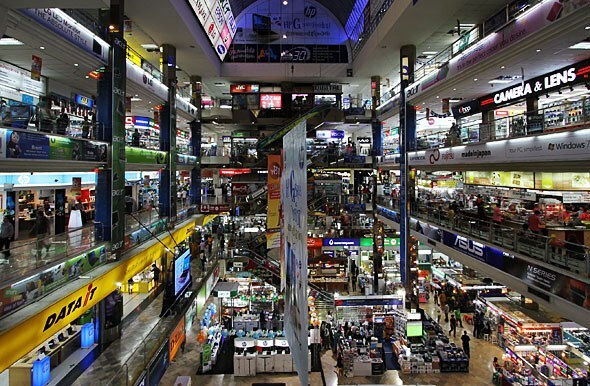 As well the large western style multi genre shopping malls described above, Bangkok is also home to large specialty malls all of which have picked their niche and do it very well. If you your a focused shopper and have a clear idea of what your after then finding the specialty mall that caters to your need is essential. These malls area a great idea and the concept is rarely found in the west. Once inside you will be faced with several floors and hundreds of specialist retailers all offering the same or similar products. This has several benefits, it forces them to be competitive on price meaning bargains for you, and it means the service level increases and these are great places if you need a little advice to help your final decision. For those looking for all matter of electronics, then Bangkok has several IT malls catering exclusively for the tech savvy shopper. Here you will find everything from cellular phones, computer parts and software to surveillance technology straight from a spy movie. These malls also offer a one-stop shop for electrical repairs and the magical little technicians here can repair almost any damage. Try Pantip plaza IT mall, Fortune town IT mall and Digital gateway, as between these 3 you will find what you need. As well as specialty IT malls, Bangkok has many other malls that specialize in all manner of things. If your looking traditional Thai clothing, Flowers, or cultural artifacts then Bangkok has a shopping mall for you. In every corner of the city you will find markets and night bazaars, and these form an essential part of the Bangkok shopping scene. Sizes of market vary from just and handful of stalls through to 35 acre sites boasting 8,500+ stalls. Opening times vary from early morning markets, daytime markets and the more popular night bazaars. Not liking the sun and heat too much many Thai’s prefer to use the night markets and as such these are the most popular, but also generally cheaper than daytime markets. You will find the daytime markets in the more touristy areas, or close to the large attractions. These higher rents and the fact that the main clientele are tourists make for heftier price tags. 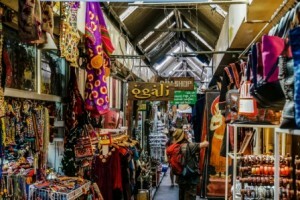 The markets are not just for those looking to satisfy there shopping needs. They are a great place to just to wander around and soak up the atmosphere, here you will find a real insight into modern day Thailand. From the wonderful array of foodstuffs on offer, and the mesmerizing smells it produces, to the latest trends sweeping the city and wider Thailand. The largest market of them all is Chatuchak market, accessible from Mo Chit BTS stop, this Disneyland of shopping is home to over 8,500 market stall holders. If you only have the chance to visit 1 market when your in Bangkok, then this is the market for you. In fact over 250,000 people a week wander its aisles in search of bargains galore. No matter what you looking for you will find it here, although locating its exact place within the market is a challenge unto itself. The only way you could describe the layout is a giant shopping octopus, with a large circular central belt from which tentacles stuffed with hundreds of stalls extend. No matter which market you choose to do your shopping at there are a few general rules that apply to all. Bargaining is a must, in fact its expected. Wear comfortable clothing and shoes you may end up trapped in shopping maze for hours. Only enter with the cash you looking to spend it’s very easy to get carried away in the buzz of the experience. Knowing in advance what your after will make the whole experience much smoother. Anybody with the slightest interest in Bangkok shopping must visit and experience one of it’s markets. As well as the more retail focused markets and bazaars, Bangkok is also home to many wholesale markets. These wholesale markets are not exclusively trade focused however and the general public is more than welcome. Many not only offer their goods on wholesale basis many also offer retail prices as well. If your a true bargain hunter then this is where you should be shopping in Bangkok. These markets are not open all day, every day. Some are early morning markets, some only open 3 days a week and others are late night markets. There are 2 main wholesale markets we would suggest visiting if you get the chance. 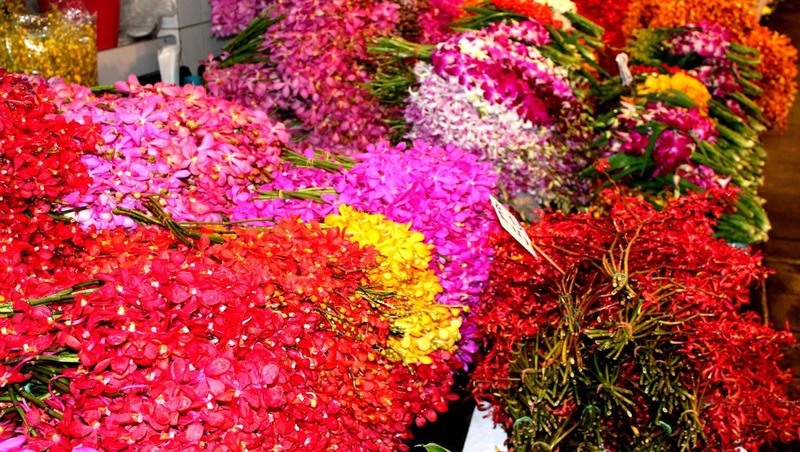 The Bangkok flower market is a place that will excite all your senses, the amazing palate of colors on show, mixed with the natural perfume that emanates from the hundreds of stalls is enough to send anybody dizzy. Although the market is technically open 24 hrs a day, the best and really only time to visit is from 0300 through to 0600. This is when the large lorry’s have restocked the vendors and the market is in full bloom or so to speak. Located in the old city near memorial bridge getting here is really only possible via taxi, or as part of an organised tour. Price here are extremely cheap and you can purchase not only native flowers but species from all over the world. The flower market is Bangkok shopping at its best. 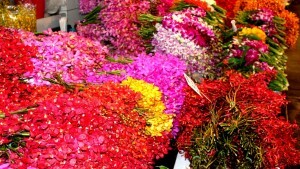 Pratunam market Bangkok is the second must see wholesale market we recommend. This eclectic mix of market stalls spread across several Soi’s and major roads is any fashion shoppers paradise. Located on the junction of Petchburi road and Ratchaprop. Again taxi is the best method of getting here. The market is mainly wholesale, although during the day many stall holders will sell single items. Even if the vendor doesn’t offer retail bear in mind you generally only need to buy 3 or 5 items to qualify for the wholesale prices. Pratunam market is where the stall holders at other markets buy their goods before adding their mark up and selling on to you. Here you will find everything you could want in the fashion sector, handbags, clothes, costumes, jewelry and shoes are the more popular wares on offer. Prices and quality vary greatly in the market and we strongly advise looking around and familirzing yourself before committing to a purchase. You could argue that Pratunam market is the heartbeat of the Bangkok shopping scene.